The Larson Electronics HAL-48-3L-LED-D Hazardous Area Dimmable LED Light Fixture is U.S./Canada approved for Class 1 Division 2 Groups A, B, C and D, UL 1598A listed, and ideal for hazardous locations where flammable chemical/petrochemical vapors may be occasionally encountered. This hazardous location LED light has a T4 temperature rating and carries a United States Coast Guard approval, making it ideal for applications such as oil rigs, ships, offshore applications, petrochemical, manufacturing, chemical storage, and water treatment centers. This four foot long, three lamp dimmable LED fixture is ideal for operators seeking a top quality hazardous location light that will reduce operating costs, improve lighting quality and reduce downtime incurred from frequent servicing intervals. The HAL-48-3L-LED-D fixture is listed Class 1 Division 2 Groups A, B, C and D hazardous area LED light that takes the reliability and efficiency of a fluorescent fixture and adds even longer lamp life and efficiency with high output LEDs. This fixture is T4A temperature rated and comes standard with our high power 28 watt LED lamps. The lamps are protected by an aluminum framed shatter and heat resistant clear acrylic lens secured with ten draw latches and the fixture is constructed of copper free aluminum alloy. The lamp reflector is corrosion resistant heavy gauge aluminum and coated with a high gloss reflective finish. We now offer our second generation LED tube lamps with this fixture which have increased this hazardous location light’s performance. 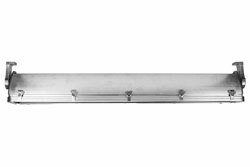 This two lamp HAZLOC LED linear fixture is lighter in weight and produces more light than hazardous location fluorescent fixtures. The four foot long LED tube design bulbs included with this unit are rated at 50,000 hours of service life, which is over twice as long as standard T8 bulbs. This fixture carries a T4A temperature rating and is U.L. 595 and UL 1598A Marine Type approved for use marine environments. The HAL-48-3L-LED-D is weatherproof and provides operators in hazardous locations with a highly efficient, reliable and affordable lighting solution for open areas where flammable chemicals and vapors may occasionally be present. Click here to read the NEC description for explosion proof and hazardous locations. We have eliminated the ballast box normally associated with explosion proof fluorescent fixtures which reduces overall weight and overall complexity of installation. There is no ballast in this unit and the included dimmable LEDT8-48-D LED lamps have a 50,000+ hour service life, both of which result in extreme efficiency and greatly reduced maintenance costs. These fluorescent LED lamps have internal drivers, eliminating external power components. The solid state design of the LED lamps give this fixture superior resistance to damage from vibration, extremes in temperature and a lamp service life over twice that of standard fluorescent bulbs. This second generation lamp is offered in 5600K cool white, 4500K natural white, and 3000K warm white. Our standard unit ships with 5600K unless different color temperature is specified. These are the first generation of our dimmable 23 watt LED tubes. Lumen output is 125 lumens per watt for a total of 2,875 lumens per bulb. While fluorescent lamps are omni-directional and illuminate 360°, the LED style replacement lamps are directional and offer a 160° beam spread. This allows for directed illumination where it is needed and not wasting light via reflectors or or over illuminating areas. This dimming LED tube uses electronic silicon control dimming. We have tested these lamps on all Lutron and Leviton electronic dimmers, such as the Leviton 6633-PLW. When using electronic dimmer switches, fixtures equipped with the LEDT8-48-D LED bulb will dim from 0% up to 100% via the user provided dimming switch. Please note: the dimmer switch must be installed outside the hazardous environment or use an explosion proof dimmer switch. This fixture will is offered in three voltage ranges: 90-132V AC 50/60Hz, 220-240V AC 50/60Hz, and 11-25V AC/DC. Operating the LED lamps outside of the designed voltage range may result in internal damage when higher voltage is applied to the lamps, and the lamp may not fuction on lower voltages. The 23 watt LED lamps produce 30% more illumination than standard T8 bulbs while offering lower amp draw and increased reliability. Each lamp produces 2,875 lumens at 125 lumens per watt, for a combined 8,625 total lumen light output. An HAL-48-3L-T8 hazardous location fluorescent light, with a combined total of 64 watts, draws 0.54 amps at 120 volts AC. This LED version of the same light, with a total of 69 watts, draws only 0.38 amps at 120 volts AC. This results in a lower amp draw while still providing increased reliability and light output. 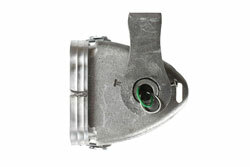 Unless otherwise specified, our standard, most popular configuration is the bracket end mounting shown enlarged below. We also offer a pendant mount for those needing to suspend the fixture away from the ceiling surface (i.e. suspend from pipe or conduit). Additional mounting configurations can be customized to meet the requirements on the application. Please contact us for special mounting configurations. 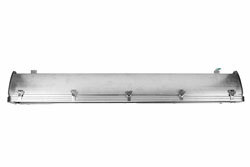 A sliding bracket mount is available so operators can retrofit this LED light fixture to use the per-existing mounting holes from other fluorescent fixtures. Below, in the related items area you can order the sliding mount bracket option. Adjustable Surface Mount Brackets: Each bracket is cinched to the bracket mounting peg on each side of the light. The angle of the bracket is set by tightening two cap screws on either side of the bracket. The cap screws act as a set screw. The bracket itself is mounted via a single bolt hole at the top the bracket. There are two brackets, one on each end of the light. Once the brackets are mounted to a surface (ceiling, floor or wall), the light fixture can be removed from the brackets by loosening the cap screws that hold the bracket to the mounting peg. Suspension Mounting: Pendant mount fixtures hang from the ceiling and are suspended by rigid pipe. Each fixture is equipped with either two 1/2" or 3/4” NPT hubs, one on each end of the fixture. Operators bring rigid pipe down to the threaded mounting hubs. Wiring is fed down through the rigid pipe to one of the NPT hubs and tied in to the fixture’s lead wires, completing the electrical connection. The remaining pendant hub provides support for the opposite end of the fixture. Suggested Applications: Aircraft maintenance, oil drilling rigs, refineries, marine and salt water environments, ships, tankers, offshore, solvent and cleaning areas, chemical manufacturing, waste treatment plants, gas processing plants. 2. Fixture arrives assembled and lamped to reduce installation time and cost. Adjustable mounting brackets enable the operator to choose any mounting angle for the fixture, where other models may only offer one or three choices. Pendant mount fixtures allow for suspension mounting via rigid conduit. 3. Fixture constructed streamlined ribbed corrosion-resistant, copper free extruded aluminum body for better hear dissipation, increasing LED efficiency and lamp life. 5. Re-lamping done via ten draw latches, which enable the operator to unlatch the lens and access the lamps. 6. Heavy gauge aluminum reflectors with high gloss reflective finish. Resists dents and corrosion. 7. 1/2" or 3/4", threaded access hole for wiring conduit on both ends of the fixture. Pendant mount fixtures have access holes on ends and back side of fixture. 8. Both surface or pendant mount units can be wired end to end in series. 9. Dimmable LED lamps 1. 50,000 hour lifespan.